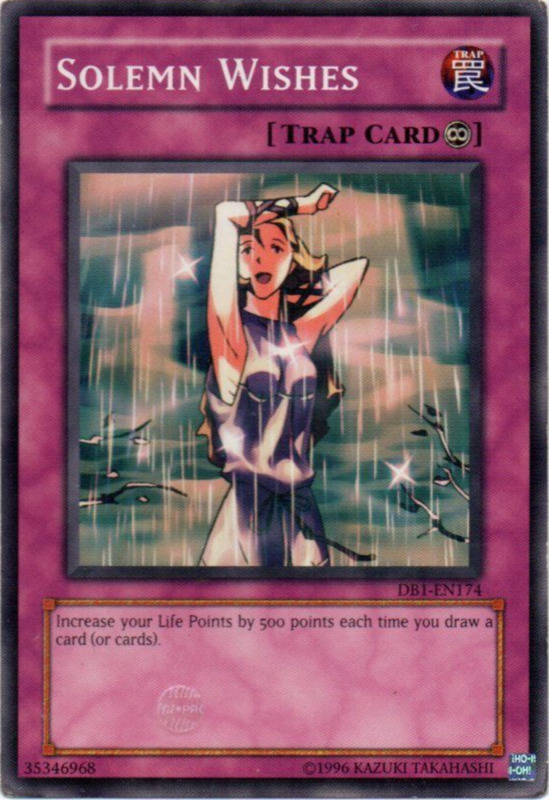 When playing the Yu-Gi-Oh card game, your main objective is to reduce your opponent's Life Points to zero. The best way to do that involves summoning powerful monsters to attack your opponent until the job is done. 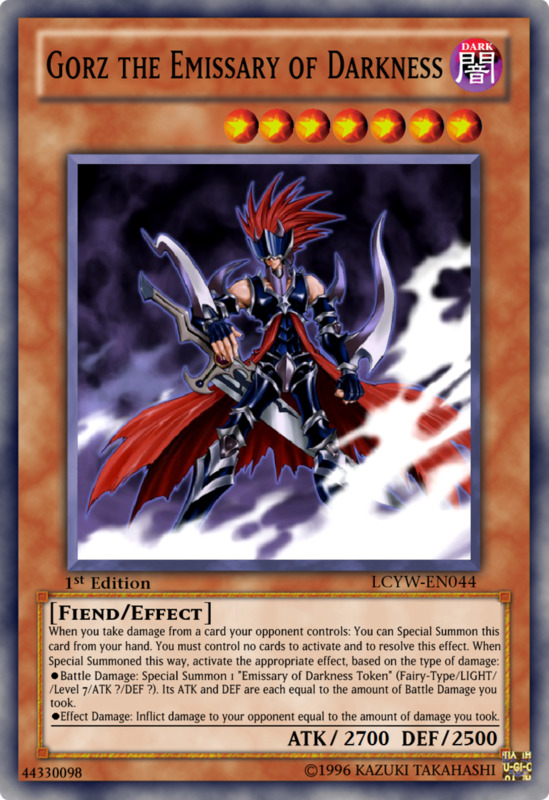 But all too often, duelists forget to give themselves a safety net if their all-out offensive fails. So today, we'll countdown some of the best monsters, spells, and trap to guard yourself from your opponent's attacks! First up, a magic card that has both you and your opponent draw a card, then neither player will take damage until the end of your opponent's next turn. One Day of Peace is a great way to add to your hand and protect you, but remember it also guards your opponent. 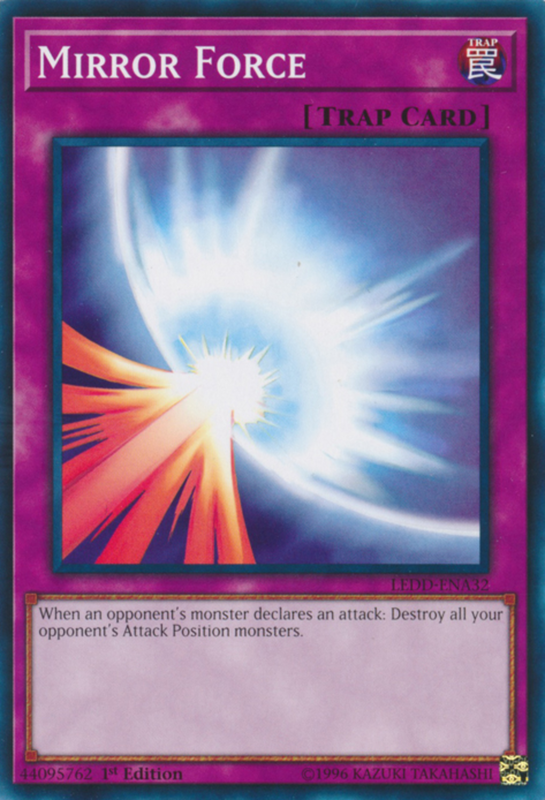 To get around this, play it during your Main Phase 2 (which comes after your Battle Phase) so that you can attack and deal damage on your turn before utilizing the defensive magic. 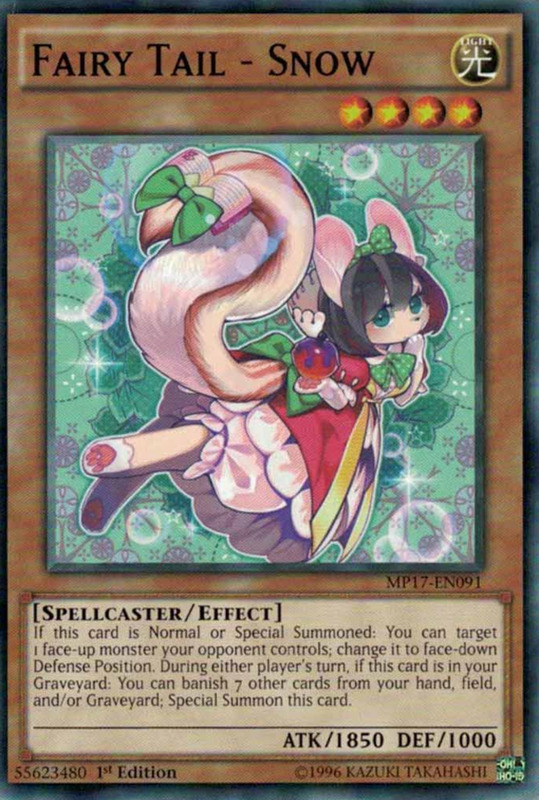 Note that this card not only protects from battle damage, but effect damage as well! Here's a simple one. Solemn Wishes grants you 500 Life Points whenever you draw. You draw a card during each of your turns, so over time, 500 will become thousands of Life Points, giving you a much larger margin of error. 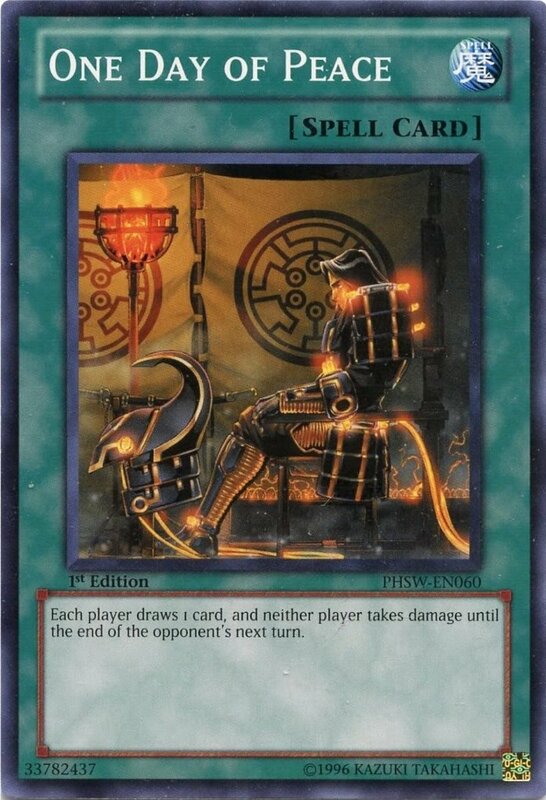 This works great with cards that give additional draws. Use it with the continuous magic Supply Squad, which (once per turn) lets you draw one card when one of your monsters is destroyed, to form a powerful combo of drawing and replenishing life. 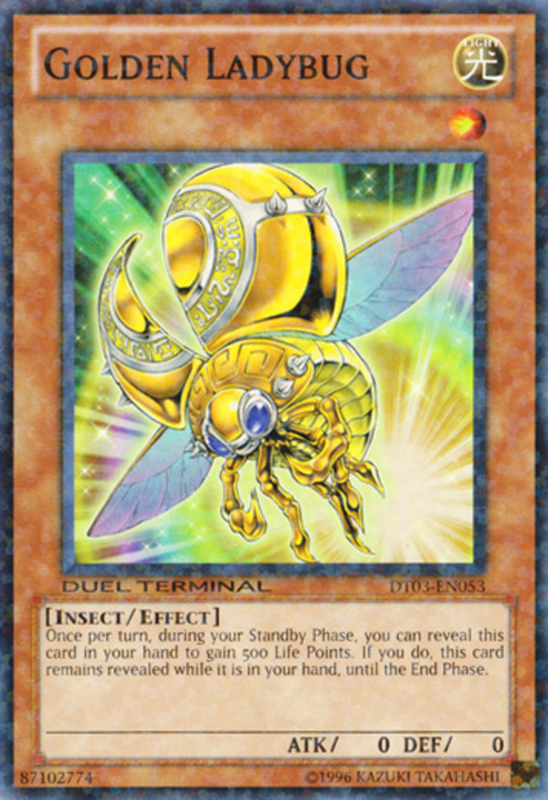 Similar to Solemn Wishes, Golden Ladybug can be activated from your hand once per turn to give 500 Life Points. Again, it's a great way to replenish your precious Life Points. Golden Ladybug can't combo with draws like Solemn Wishes can, but because it remains in your hand, it's much harder for your opponent to destroy. In addition, you can set this monster in defense position to block an attack if things get desperate. Marshmallon won't be defeating many opponents with its measly 300 attack and 500 defense, but it makes a great wall against attacks. Its effect prevents it from being destroyed in battle, no matter how high your foe's attack is. Until your opponent can destroy Marshmallon with an effect, you'll be well defended against their assault. 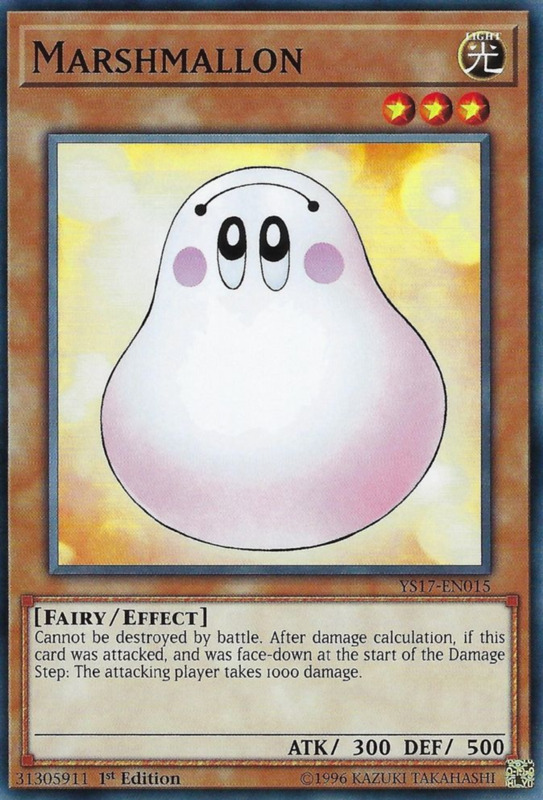 Marshmallon also has an effect to inflict 1000 points of effect damage when it's flipped over from face-down defense position! Metal Reflect Slime is simple, but effective. When activated, this trap turns into a monster with zero attack but a whopping 3000 defense. Few monsters can overcome that amazing wall. 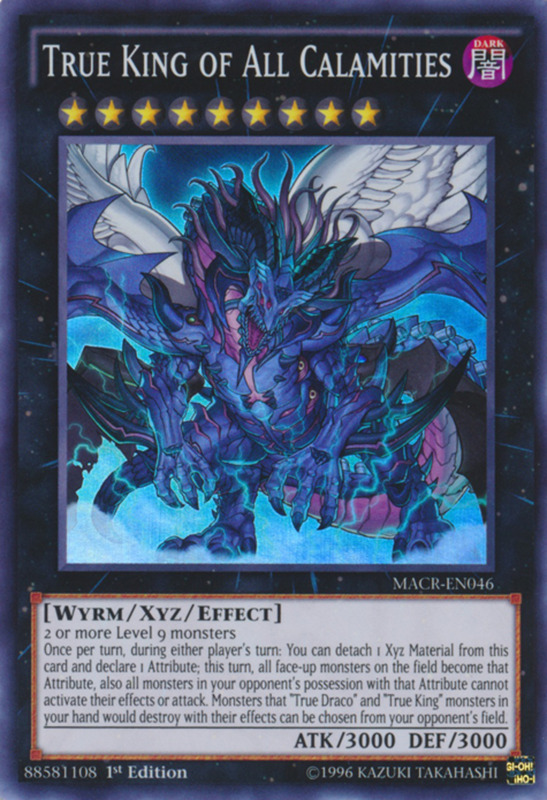 Also, once summoned, this card's monster Level is ten, making it useful for Xyz summoning Rank 10 monsters, or for Ritual Summoning high-Level beasts. 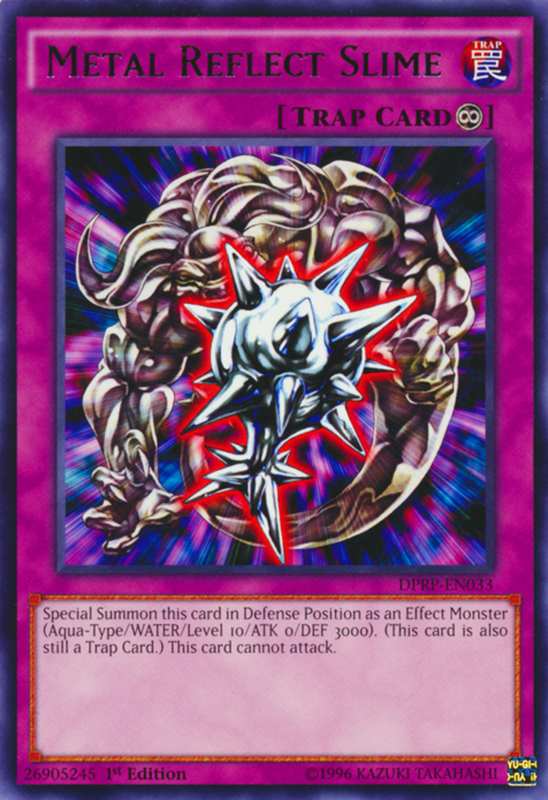 Metal Reflect Slime forms an impressive barrier, and because it's a trap card, it doesn't use up your Normal Summon during your turn. With zero attack and defense, Battle Fader is the weakest of the weak.. in combat. 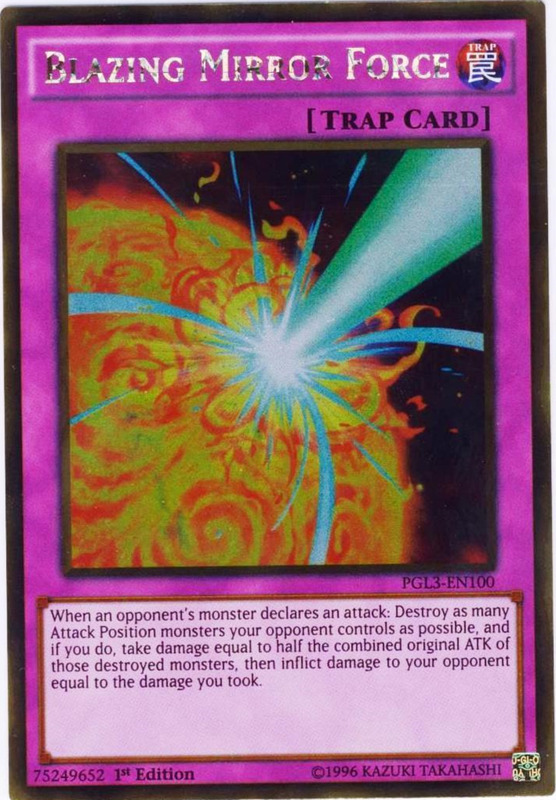 But its awesome effect can make or break a duel. When a direct attack is declared against you, activate this card from your hand to end your opponent's Battle Phase and summon this card. Battle Fader not only prevents your opponent from attacking for a turn, but allows you to summon during your opponent's turn. Use this summoned monster to either block one attack next turn, or sacrifice it to call forth a powerful monster. A personal favorite, Scrap-Iron Scarecrow, unlike most traps, is reusable. Once per turn, it can negate an opponent's attack. Then, this card is once again set in your spell/trap zone, ready to be used next turn. Scrap-Iron Scarecrow can only block one attack per turn, but its ability to do so repeatedly gives it incredible potential. First, the bad. 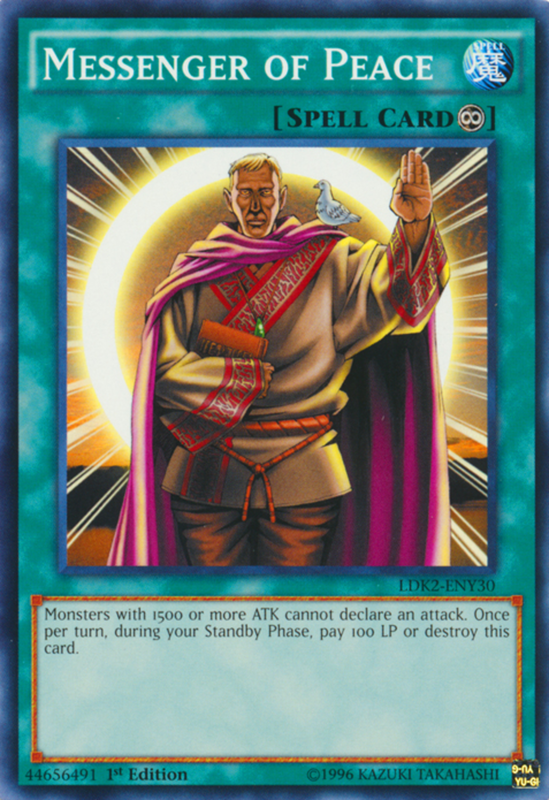 Messenger of Peace drains 100 Life Points from you each turn its active. But that's a very low price to pay for its ability: Monsters with 1500 or more attack cannot, well, attack. Only the weakest of the weak will be able to battle, and it shouldn't be hard to repel them using a monster with solid defense. Messenger of Peace can drastically stall for time while you replenish your hand and prepare your next offensive. 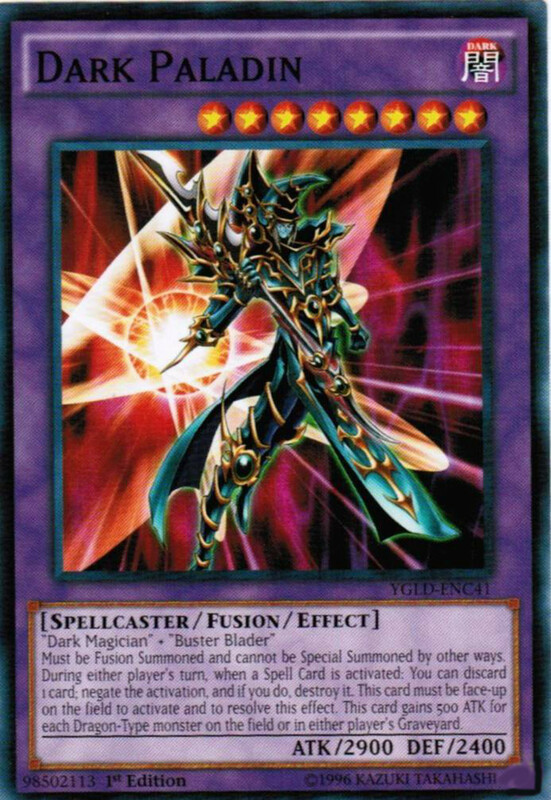 This spell prevents you from attacking as well as your opponent, but you can get around this by placing weaker monsters in your deck. Hard to beat the classics. 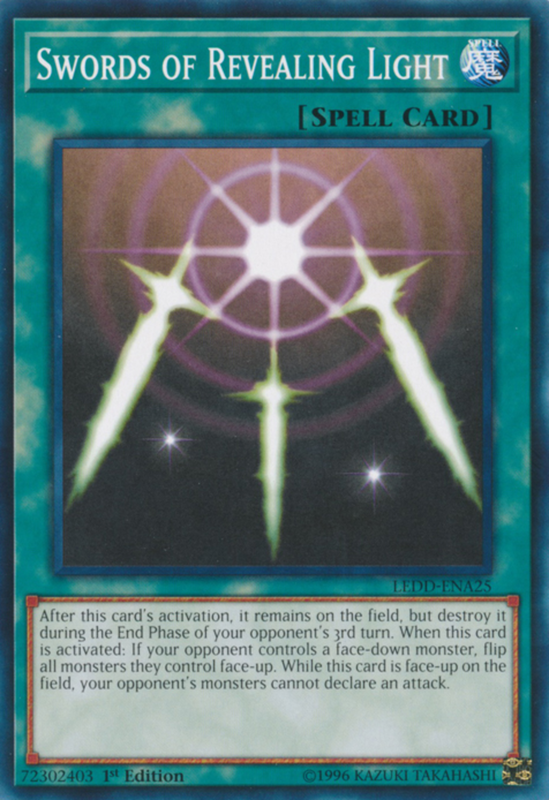 One of the oldest spells in Yui-Gi-Oh history, Swords of Revealing Light prevents your opponent from attacking for three turns. Additionally, when activated, all face-down monsters on their side of the field are flipped-over, revealing them and helping you plan your next move. Three turns of protection for no cost, plus the revealing effect. Need I say more? We knew it was coming. This classic trap has installed anixety into duelists for years. Is that one face-down card they have Mirror Force? If it is, all my attack-position monsters are going to be destroyed. Yikes. Mirror Force has prematurely aged many duelists, and I wouldn't have it any other way. Place some in your deck to fend off and destroy many a foe. Hopefully you've learned some effective ways to defend your Life Points. We've covered many awesome defenses, but these are just a sample of what can be found in Yu-Gi-Oh. Experiment until you find the perfect cards for you, and establish the right balance of offense and defense. And check out the variants of Mirror Force, like the formidable Drowning Mirror Force! 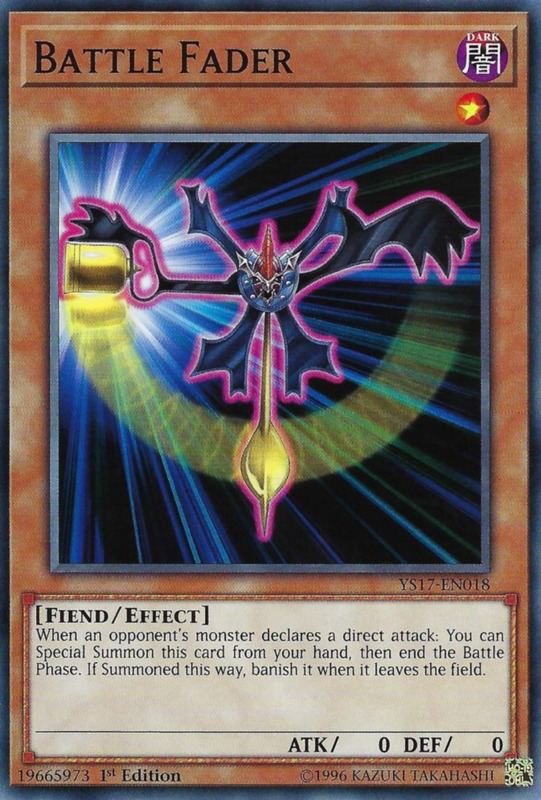 Can you still attack if you play Swords of Revealing Light during a Yu-Gi-Oh card game? Yes. It only stops your opponent from attacking. Can Scrap-Iron Scarecrow infinitely stay in the trap zone? Yes. 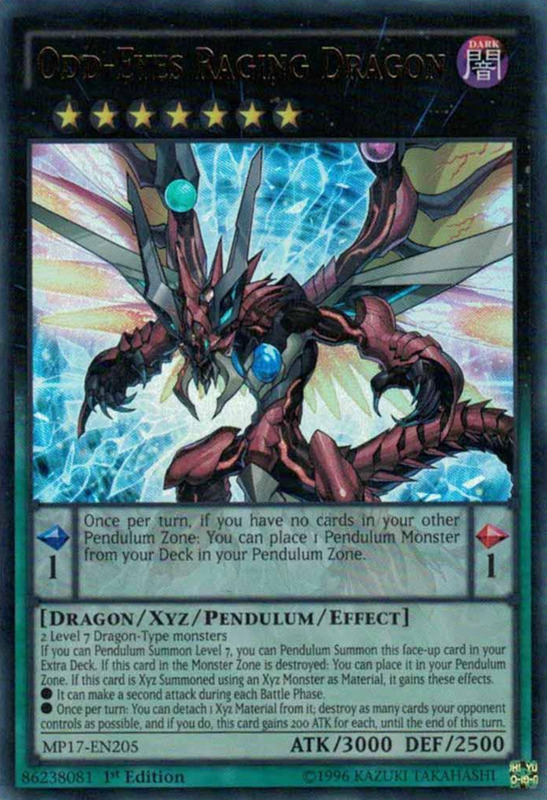 Each copy can only be used once per turn, but after activation, it remains in its trap zone space, ready to be used again during your opponent's next battle phase. This makes it quite the annoyance, as it repeatedly deters attacks. 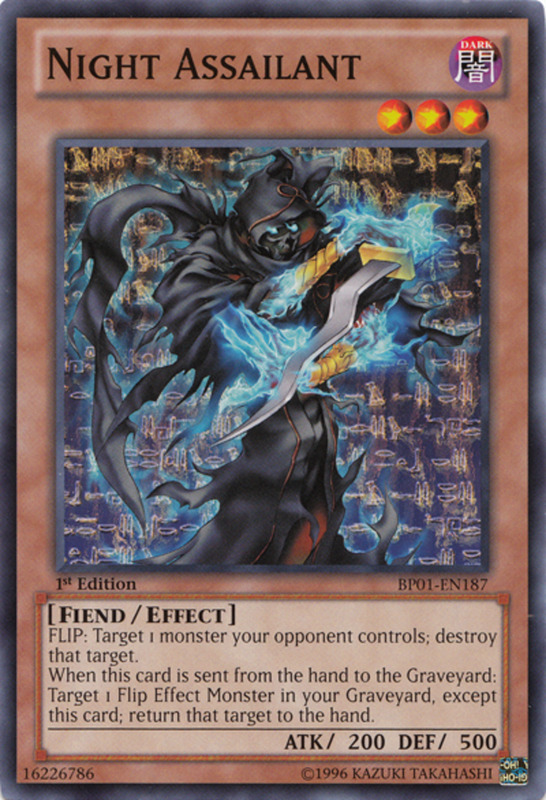 Dark Mirror Force is a very situational card, as it punishes defense position monsters. 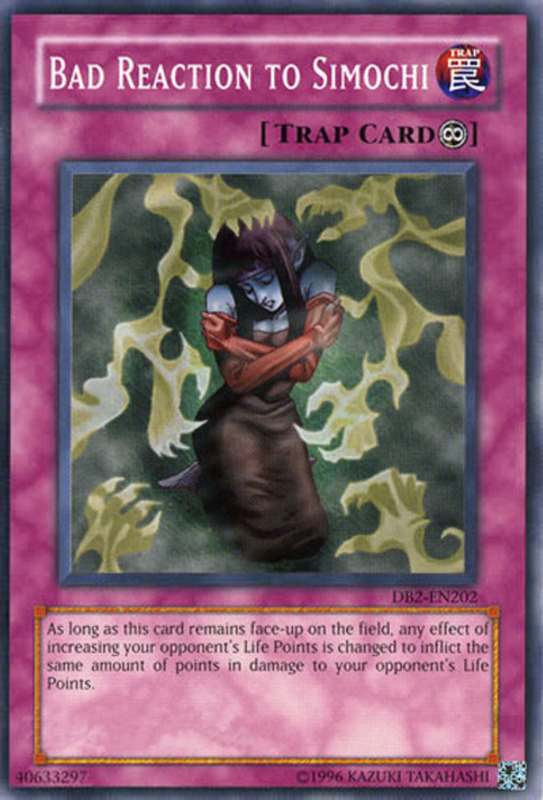 It also hasn't aged well, as link monsters (who can't exist in defense mode) are essentially immune to it. Yes, it helps against the Superheavy Samurai since they can attack from defense position, but that's an extremely rare ability. In general, I much prefer Blazing, Drowning, and regular Mirror Force. 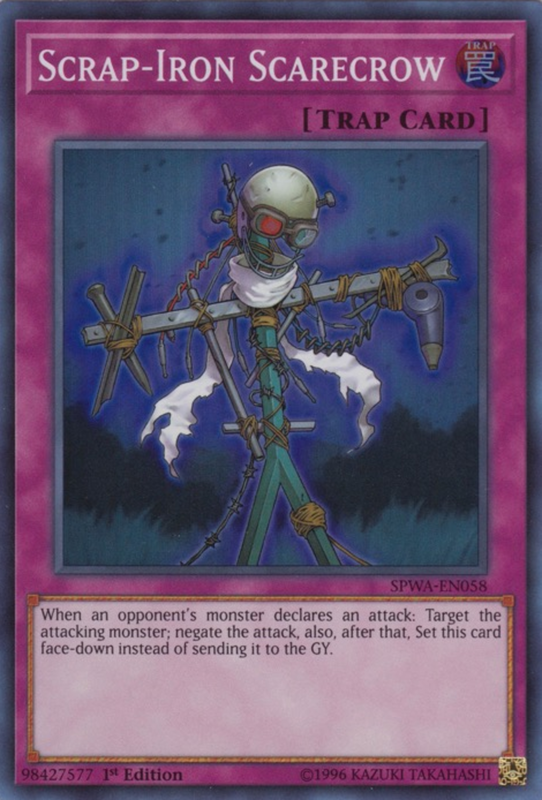 While battle fader vulnerable to card effect that negate/restrict special summon, swift scarecrow would be good alternative. Good suggestions; in fact, Gravity Bind is appearing in a follow-up defensive card countdown I'm working on. Juragedo didn't quite make the cut, but it's still an interesting card. A good offense often is the best defense, but now that the game has slowed down from the fast-paced pendulum era, cards like Final Countdown are viable once more. Also what about Juragedo and gravity bind?